"Great Product for Covering Basics"
For where I'm at with text game, this book has been very helpful. I feel like a novice when knowing when or what to text girls. It's a HUGE sticking point that I'm trying to work on. Positive: I previously had basic questions like when to text, how much to banter before moving into asking for the meetup, etc. This book was simple in answering my questions. 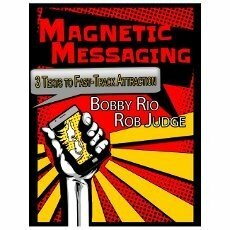 I've read 3 products on texting (Including the Ultimate Phone and Text Guide) and this one is my top one so far. Ultimate Phone and Text was good, but maybe it was too advanced for me. For example, where Ultimate...would say something like: When you text her at this point, you should say XYZ and I was thinking, oh, I'm supposed to text her at that point? Magnetic Messaging however was easy and helpful. They would say, ok, here is when you text her and how many times and what to say and when to make certain moves, etc. Negative: Even though this is the best product for my beginning texting level, I still felt like I had unanswered questions. For instance, one of the authors' rules' is, "don't allow X nuber of texts go before going for the meetup" and then later they say a different number. Also the example texts consistently break the rules they give about certain kinds of texts and numbers of times to text. This is fine, I'm flexible to know that you don't always have to follow the rules. However, I'm looking for real basic here. I need to walk before I can run. It would have been more helpful for me to have consistency in the book. The rules, plus the examples, plus the later lattitude on the rules, along with a seeming inability to apply the rules simultaneously gave me some confusion. It's even more confusing because the book says "stick to the formula." It's hard to do that when the formula seems inconsistent. As you can see, I need baby steps bc I've never done this before. All in all, a great book, the best fit for me for text game.